Besides the animals that live on your farm, there are a lot of wild animals living in each of the three towns. These wild animals cannot become pets on your farm, but you can raise your friendship with them to see Furmiliar events and receive a gift item as a "thank you" for your kindness. If you have 300 FP or less, the wild animal will wander away when you get close; in the case of the wild bears in South Westown, they act aggressive towards you (although they do not hurt you). Picking the animal up, or patting it on the head, will return a "..." emotion bubble. Between 301 FP and 700 FP, the animal will stop running away. Even the wild bears will be less aggressive. You'll see a music note emotion when interacting with the wild animal. At 701 FP or higher the wild animal will walk towards you if you're nearby. Interacting with it will result in fluttery hearts appearing above the animal's head. Auu, how adorable! Maximum friendship with each family is 1000 FP. To feed a wild animal, hold a piece of food in your hands and either stand on top of the wild animal and press the A Button to drop it onto the ground, or stand farther away and toss the food onto the ground so that it lands close to the wild animal. Throwing food onto the ground is not considered the series-standard "littering" that would negatively impact friendship. Sometimes trying to give food can be a bit tricky, but if you keep at it eventually you'll get the wild animals to eat your food offerings. Interacting with a wild animal will also earn you friendship. For the smaller animals, picking them up will earn +5 FP, and for the larger animals patting them on the head will earn you +10 FP. You can feed and interact with each of the wild animals of a family to earn multiple points per day. For example, there are two wild brown weasels in the Crossroads and four wild brown weasels in South Westown. Feeding all six of those weasels each day will quickly raise the friendship point value for the brown weasel family. You can reduce your friendship with the wild animals if you hit them with your farm tools or throw something into the water (which is actual "littering"), but if you never do those things then the wild animals' friendship levels will remain as they are. You can ignore wild animals and their friendship levels won't drop. Once your friendship with an animal family becomes 800 or higher, exiting your farm house may randomly trigger a gifting event. You'll find an item on the ground and discover that it was gifted to you from the wild animals. This is a one-time event, and the items you can receive from the wild animals aren't anything super special; basically you'll get colored pearls and mine gems. There is also an in-game trophy to raise your friendship to maximum (1000 FP) with all of the wild animals, but like all the other in-game trophies you don't receive a special reward or unlock anything unique for completing the achievement. Wild animals won't appear in the Crossroads, Westown, or Tsuyukusa if it is rainy or snowy outside; the wild animals in Lulukoko don't mind the weather. No wild animals will be available during a typhoon or snowstorm. Some wild animal families only become available when you raise your friendship with a similar wild animal. The standard brown weasel is available from 8:00 to 16:00 in Spring, Summer, and Fall seasons. The white weasel is the Winter season variety. Both colors like the same items. These animals can be found in the Crossroads or South Westown. These wild animals are available in the Crossroads or South Tsuyukusa from 8:00 to 16:00. The standard brown foxes are found in Spring, Summer, and Fall. The white foxes are found during Winter. You will need to have some friendship with the fox family if you want to marry Tsuyukusa guardian Inari. The bears will charge at you if they see you nearby, but they don't hurt you at all. The bears are available from 8:00 to 16:00 in South Westown. The black variation will appear once you have 500 FP with the standard bear. The bears hibernate during Winter and reappear in Spring. This large bird appears in North Westown from 8:00 to 16:00. There is an eagle by Ford's clinic, but it doesn't move anywhere; the one you can interact with is in the southwest corner of North Westown. It will fly in the air and walk on the ground, so you've to wait until it is walking to give it food. The eagle is not around during Winter season. A few turtles can be found in the surf in South Lulukoko. They will pop into their shells if you get too close, so you may need to drop food on them while they're tucked away; they'll eat it when they emerge from their shells. The turtles are there year round from 8:00 to 16:00. And turtles are cool, especially the ninja variety. The monkey hangs out under the banana trees in South Lulukoko from 8:00 to 20:00. Once you have 500 FP with the brown monkey, the golden monkey will appear by Mithra's research laboratory. 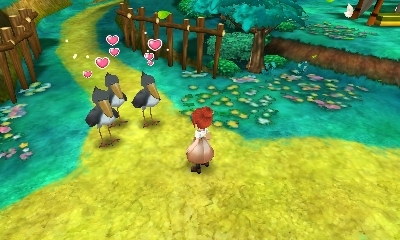 This large bird has a different schedule than the other wild animals, found in South Lulukoko from 13:00 to 16:00. It appears after you have 500 FP with the peacocks. It is slow moving and sometimes gets in between the Beach Vitex and Ocean Primrose, but just wait a little bit and it will walk back out so you can feed it. Up at the top of the staircase at the ruins in North Lulukoko are the peacocks. Sometimes they can be tough to see with the stone pillars in the way. The birds will be there from 8:00 to 20:00, and on occasion will spread their great tail feathers for you. There are four colors of parrots in North Lulukoko from 8:00 to 16:00. The white parrot and yellow parrot are available from the beginning of the game, the red parrot unlocks once you have 500 FP with the white parrot, and the blue parrot unlocks once you have 500 FP with the white parrot. These long-tailed guys are up by the communal kitchen in North Lulukoko, by the Breadfruit shrubs. You can find them hopping around from 8:00 to 20:00. The raccoon (or tanuki) can be found from 8:00 to 16:00 at the southern entrance of South Tsuyukusa. The black raccoon appears after you have 500 FP with the raccoon. Every so often you might find that one of the animals has walked into the entrance area to the Crossroads, so when you go to feed them you end up exiting the area. These little birds hop around Tea-ful Reunion in North Lulukoko from 8:00 to 19:00. The darker sparrow unlocks after you have 500 FP with the standard sparrow. Sometimes they get in between the Himousen Mats outside the teahouse, which makes it harder to give them food. They're pretty small though, so just pick them up and move them to the open area. This bird hangs out by Kasumi's house in North Tsuyukusa from 8:00 to 16:00. Be careful when trying to give it food. If your offering lands in the water, then you'll be "littering" and lower your friendship with everyone in North Tsuyukusa; -2000 FP with humans and -10 FP with the wild animals.